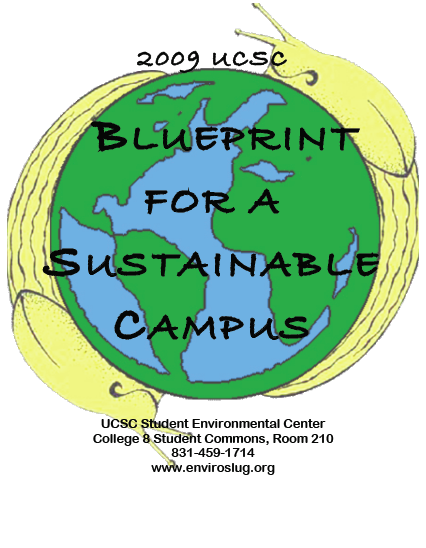 The Blueprint for a Sustainable Campus is UCSC's annual student-run guide to sustainability. It contains visions and actions on 10 topics in sustainability ranging from food systems to energy to social and environmental justice. Each vision is the a goal a student would like to see happen on campus, and each action is a way to get there. Year after year, students evaluate the state of UC Santa Cruz. It’s one step in the process to create positive change on campus and beyond. We know that many students, staff and faculty value sustainability and work towards its realization. But other forces, like funding, sometimes drive the University in an opposite direction. For example, a vision might be "UC divests from fossil fuels" and its corresponding action might be "Students organize and protest current investments". 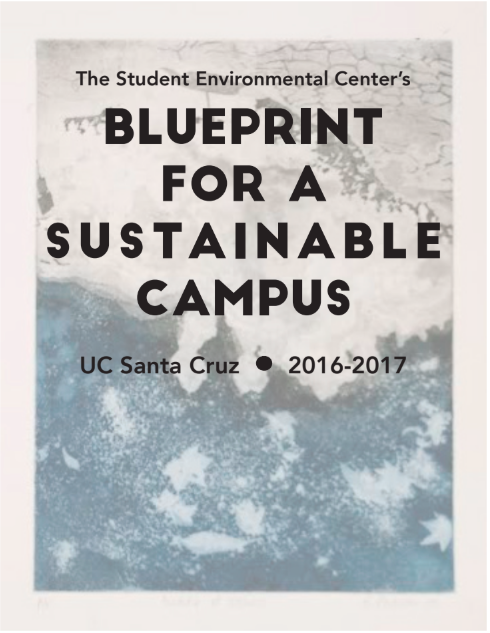 The Blueprint provides student perspectives on sustainability at UC Santa Cruz, along with students’ visions— the attainable, the idealistic, and the urgent—for what UC Santa Cruz should be, especially in a dynamic and changing world. The Student Environmental Center (SEC) has issued a new version of the Blueprint every year since 2002. SEC hosts events called Blueprint Breakouts each Winter where SEC members and other students, staff and faculty discuss topics in sustainability and work to identify visions and actions (V&As) for how our campus could be more sustainable. These V&As are added to the Blueprint. This Blueprint is also a resource guide. We give history and background information in each topic, as well as references for further research. We want this document to be used as a resource guide for students interested in a specific topic. We mean for individuals to read this Blueprint, but we also mean to reach organized groups, especially student organizations. We believe student organizations can best drive systematic change. The Blueprint guides our organization, the Student Environmental Center. Further, it is a resource guide and a way to get funding for students in student organizations. Each Winter and Spring, student organizations can apply for funding for projects related to Blueprint visions and actions through the Campus Sustainability Council. It is also used to give student voice to campus policy and the creation of plans such as the 2017-2022 Campus Sustainability Plan. Past Blueprints and visions helped shape campus sustainability. For example, the Walk to Class Challenge, Bike Library and Sustainability Minor were all visions identified in past Blueprints. Now, they exist! In general, the Student Environmental Center and past student organizers have helped institutionalize sustainable practices and values on campus. Click on the blueprint cover to read it!